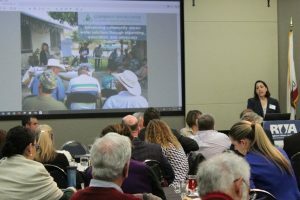 SACRAMENTO—A capacity crowd of leaders from state government, local water providers and the non-profit sector came together on March 15 in Sacramento at a symposium to explore the challenges and potential solutions that can help make safe, clean, affordable and accessible water a reality in California. 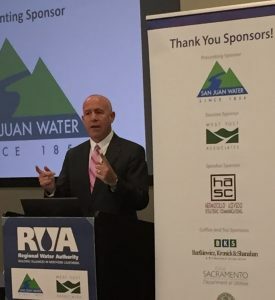 Hosted by the Regional Water Authority (RWA), the event featured introductory remarks by Sacramento Mayor Darrell Steinberg and two panels focused on identifying the challenges and then discussing potential solutions. Mayor Steinberg began the morning by urging the audience to embrace “principled compromise” as they consider the topics to be discussed. “Principled compromise is not some Pollyanna notion that you should give up for the greater good. Principled compromise is when you recognize that you need to do something, because if you don’t, the consequences of inaction are going to be worse than what you may have to give up in order to achieve the compromise,” he said. Panelists in the first session provided background about the scope of the issues, both from statewide and ground-level perspectives, and discussed how their organizations are helping to address the challenges. Bruce Burton, Assistant Deputy Director of the State Water Resources Control Board Division of Drinking Water, noted that the systems that struggle most typically serve micro populations with 25 to 500 people and face special challenges such as inadequate staffing, difficulty in funding infrastructure improvements and poor economies of scale. Denise England, Water Resources Director for Tulare County, described how the county is helping disadvantaged residents develop new water delivery systems and connect with neighboring communities to resolve issues with access. Maria Herrera, Community Development Specialist with Self-Help Enterprises and a member of the California Water Commission, discussed some of the progress made in recent years to help disadvantaged communities access clean drinking water, including funding for technical assistance provided by Proposition 1. Katie Porter, Staff Engineer with the California Urban Water Agencies (CUWA), said that issues of affordability also affect urban populations, noting that 21 percent of the population served by CUWA agencies is impacted by affordability, and that there is no single solution to the challenges. The second panel explored some of the proposed solutions under debate in the legislature, as well as those actively implemented by California’s regulated water utilities. Laurel Firestone, Co-Founder and Co-Executive Director of the Community Water Center, said that while progress has been made, a major barrier is lack of funding for operations and maintenance, capital planning, technical assistance and other needs. She described the proposed solution set out in Assembly Bill 623 (Monning), which prescribes a tax on residential water bills and agriculture-related fees. Paul Jones, General Manager of the Eastern Municipal Water District (EMWD) outlined solutions proposed in Assembly Bill 2050 (Caballero), which is co-sponsored by EMWD and the California Municipal Utilities Association. The bill focuses on “reforming the service delivery model,” Jones said, including consolidating ultra-small failing systems to provide economies of scale and revenue sources. Max Gomberg, Water Conservation and Climate Change Manager with the State Water Resources Control Board, addressed affordability solutions, saying, “It doesn’t do anyone any good to have water coming out of the tap if you can’t afford it.” He discussed Assembly Bill 401 (Dodd), passed in 2015, which charges the State Water Board with developing a plan for funding and managing a statewide low-income rate assistance program, and Senate Bill 998 (Dodd), which proposes additional noticing and other requirements for water providers before shutting off water service for non-payment. Jack Hawks, Executive Director for California Water Association (CWA), which represents 101 water utilities regulated by the California Public Utilities Commission, described some of the solutions CWA’s members have undertaken. These include providing mentoring, technical and grant assistance to smaller systems, consolidations with smaller systems and offering low-income rate assistance (LIRA) programs for customers. He noted that all of the state’s largest regulated utilities offer LIRA programs, which on average enroll 19 percent of their residential customers who receive an average monthly discount of $9.50 on their water bill. Cindy Tuck, Deputy Executive Director for Government Relations at the Association of California Water Agencies, wrapped up the panel with her thoughts on the path forward. “As you look for future solutions, it’s good to look at past solutions,” she said, citing the process for developing Proposition 1 and the Governor’s Drinking Water Stakeholder Group, a multi-stakeholder task force that developed statewide recommendations to address drinking water challenges faced by disadvantaged communities. RWA thanks the sponsors who made the dialogue happen including San Juan Water District, West Yost Associates, Hermocillo-Azevedo Strategic Communications, Bartkeiwicz, Kronick & Shanahan, the City of Sacramento Department of Utilities, the Metropolitan Water District of Southern California, California American Water and Sacramento County Water Agency. Panelist presentations are available by clicking here.